At Interlake, there is nothing more important to us than the health, safety and well-being of our employees and their families. Reducing emissions on the Great Lakes and leading the way with advanced technologies since 2006. We carry the building blocks of America. We move the raw materials that power the Great Lakes region and beyond…it’s what we’ve done for more than 100 years. All Interlake vessels are U.S.-built, U.S.-owned and U.S.-crewed. We go the extra mile to ensure we provide our customers with unparalleled service while managing their logistic challenges. "We deliver our commitment to a customer-first philosophy through our core values of Integrity, Respect, High Performance and Accountability." Thank you for visiting The Interlake Steamship Company. We are a family-owned company tracing its history more than 100 years on the Great Lakes, but now we are a modern marine transportation business that is made up of 400 company family members who make us who we are today. Please explore our website to learn more about the exciting things we have been doing to ensure our fleet is on the forefront of technology and environmental stewardship while delivering the essential cargoes our customers require to drive the economy of the Great Lakes region and the nation. We are honored to partner with some of the best steelmakers, power generation companies, aggregate suppliers & users, and others that choose to move their raw materials on lake freighters — the most environmental and efficient mode of transportation. I have had the honor and privilege to support our teams on land and by sea in delivering innovative solutions for our customers. Without question, our history is rich in tradition and accomplishments, but I am excited about the future and where we are headed to meet the new demands for logistics in the Great Lakes and beyond. So come explore who we are, what we can do and let us find a solution for you. Our 2019-2020 Shipping Season is Underway! 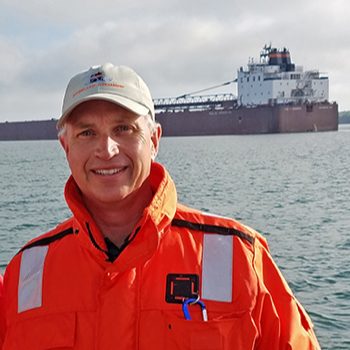 STURGEON BAY, WISCONSIN, April 9, 2019: A U.S.-flagged Great Lakes bulk carrier will be built for the first time in more than 35 years thanks to a historic agreement recently signed between The Interlake Steamship Company and Fincantieri Bay Shipbuilding. The new River-Class, self-unloading bulk carrier is believed to be the first ship for U.S. Great Lakes service built on the Great Lakes since 1983. The ship, which will transport raw materials to support manufacturing throughout the Great Lakes region, also represents hundreds of good-paying jobs for U.S. Merchant Mariners and Wisconsin shipyard workers.